Our passion for authenticity and service is evident everywhere: from the Bavarian architecture and woodwork, to our imported furniture, to our traditional breakfast in our beautiful breakfast room. You will not find a more authentic Alpine lodging experience without traveling to Europe! It is our privilege to welcome and serve friends from all corners of the world. We invite you to come enjoy the quiet comfort and charm of Hotel Pension Anna. Pension Anna is one of the most authentically Old World Bavarian designed buildings in Leavenworth. It was designed and built by Anne and Bob Smith (left on photo) in 1989. They drew their inspiration from Bavaria and Tirol where they had resided, traveled and extensively researched the architecture, culture and history. 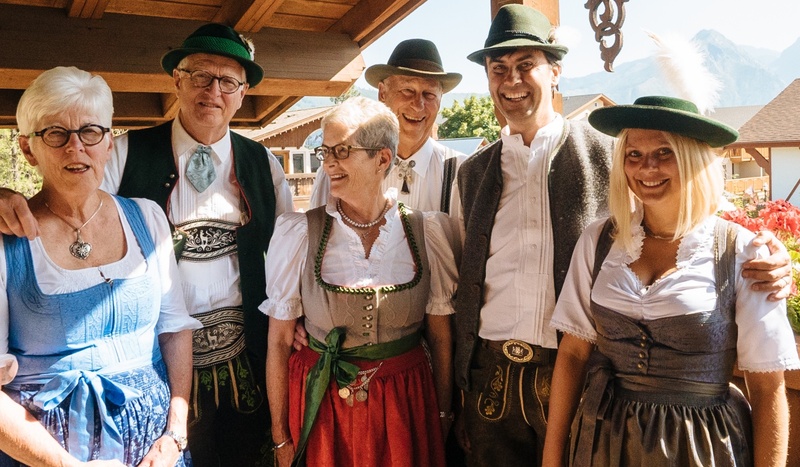 They have been an integral part of Leavenworth transformation and while retired, Bob is still serving on the city Design Review Board that ensures the town maintains a true old world Bavarian theme. In December of 2007 Gary and Michelle (middle) took on the hotel and carried on the tradition of a true Bavarian Pension. Gary had been a member of Leavenworth Alphorns often seen playing in the Front Street Gazebo during long summer weekends. They are now happily retired! In May 2018 Erika and Martin (right on photo) became the third generation of Pension Anna owners. They are the first European born owners of the hotel bridging their ancestry closer to the hotel's origins. While they met in Seattle, they fell in love with Leavenworth and got married standing in the snow by Icicle Creek facing the Enchantments on a blue bird crispy Leavenworth morning. They are hoping that they meet a lot of new friends who decide to make Pension Anna their home during visits to Leavenworth.